With the 2016 Summer Olympics just beginning in Rio, Brazil, the whole world is preparing to watch the best athletes display their skills. Many of the Team USA members are from all around the country, from Boulder, Colorado all the way to Tenafly, New Jersey. All the hard work and talent of Team USA is going to be highlighted on the world stage, as we watch and hope they take home the gold. The Central Coast has been home to a few Olympians over the years, becoming a backdrop for their dedication and training. Luckily, we even have a participant in this year’s Olympic Games! It’s time to break out the patriotic gear once again and gather your friends to celebrate our forthcoming successes. In the mean time, check out some of these Central Coast Olympians who have made us proud in the past and will continue to in the future. Novachkov was a wrestler at Cal Poly San Luis Obispo, boasting an amazing career full of wins and national titles. He had stellar campaigns every year he attended the university, even bringing home a second place national finish in his overall record his junior year. He was a three-time All-American wrestler during his time at Cal Poly and was named Male Athlete of the Year for 2011-2012. He is planning to compete in the 65-kilogram weight class for freestyle wrestling this summer, so check out the schedule of events to see him participate! With a dual citizen ship in Bulgaria and the United States, Novachkov qualified in Instanbul and will represent Bulgaria in these Olympic Games. Stats and information on Novachkov can be found here. Trafton was not only a Cal Poly San Luis Obispo student, but also a Central Coast native! She began a stellar track career at Arroyo Grande High School and graduated from Cal Poly in 2004 after winning the NCAA All-American honors in outdoor track and field three times. She was a seven time Big West champion for discus and shot put, still holding Cal Poly records for these events. As Cal Poly’s Female Athlete of the Year in 2003, Trafton was the first Cal Poly graduate to win a gold medal! In 2008 Trafton competed in the summer Olympic Games in Beijing, China for the women’s discus event, winning with a mark of 212 ft 5 in. Visit Trafton’s website for her background and athletics information. Gina Miles was a Crop Science major at Cal Poly San Luis Obispo and spent her free time training in the equestrian event of “Eventing.” A lover of horses since age 7, Miles spent her life dedicated to learning how to ride and eventually how to compete. Her path to the 2008 Olympic Games started with her commitment to becoming the best in all three of the Eventing disciplines. She has also won multiple state and national championship titles, including Gold and Bronze Medals at the Pan American Games and Bronze at the World Cup Finals. Miles won the Individual Silver Medal in Eventing in 2008, a discipline she finds influential as it is one of the only sports where males and females compete as equals. 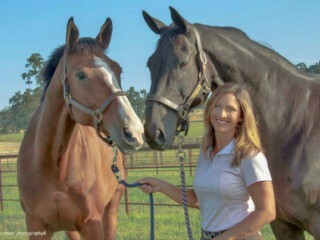 Miles now operates a full-service equestrian business called Gold Medal Equestrian and is an expert in re-training difficult horses. Head to mileseventing.com for Miles’ Olympic and training information. Sharon Day-Monroe is a California native, attending Cal Poly San Luis Obispo and winning the 2005 NCAA Women’s Outdoor Track and Field Championship. Day-Monroe’s mother was an elite high jumper and her sister also competed competitively in the high jump for the University of Arizona, so expert athleticism definitely runs in their family. Day-Monroe went on to train in the heptathlon, although making the Olympic team for high jump in 2008. During this Olympic period, Day-Monroe qualified for the event, but did not end up advancing to the finals. In 2012 she went on to compete in the heptathlon event, winning the Silver at the Olympic Trials, but finishing 16th overall at the Games. Check of Day-Monroe’s profile on the USA Track & Field Team website for more information on this athlete. Karen Kraft attended the 1996 Olympic Games and the 2000 Olympic Games, winning medals both times. In high school Kraft was unable to even be accepted into a varsity sports program, although this didn’t discourage her. When she went on to study at Cal Poly San Luis Obispo, she discovered competitive rowing and excelled at the sport. After meeting her rowing partner, Missy Schwen, Kraft competed in the women’s pair rowing events at the 1996 Olympic Games in Atlanta, bringing home the Silver Medal. They competed again in the 2000 Olympic Games in Sydney, Australia, this time snagging the bronze medal. Visit Kraft’s profile on worldrowing.com for more information on her career. Feeling inspired by Karen? Check out this comprehensive guide on rowing training on Sports Fitness Advisor.